A restoration expert works on a mosaic inside the Church of the Nativity, in the West Bank city of Bethlehem, Feb. 4, 2016. After two years of painstaking work, experts have completed the initial phase of a delicate restoration project at the Church of the Nativity, giving a much-needed face-lift to one of Christianity's holiest sites. The project, partially funded by the Palestinians and conducted by a team of Palestinian and international experts, is the biggest restoration at the iconic church in some 600 years. The removal of centuries of dust has left Crusader-era mosaics sparkling in sunlight filtering through brand new windows. Structural repairs on the fragile rooftop and windows have been completed and art treasures have been returned to their delicate elegance. Although the Palestinians are overwhelmingly Muslim, they consider the church a national treasure and one of their most visited tourist sites, and President Mahmoud Abbas has been actively involved in the project. Ziad al-Bandak, who leads the Palestinian committee in charge of the restoration, calls what has been accomplished so far nothing short of "revolutionary." "For the first time you can see, when you go up, mosaics really magnificent and beautiful and unique in the whole world,'' he said. The Church of the Nativity, located in the biblical West Bank town of Bethlehem, was built by Saint Helena in the 4th century over the grotto where the Virgin Mary is said to have given birth to Jesus. A cracked mosaic is prepared for restoration inside the Church of the Nativity, in the West Bank city of Bethlehem, Feb. 4, 2016. Despite its spiritual significance, the church was neglected for centuries and is listed as endangered by UNESCO, the United Nations cultural agency. Until two years ago, rain leaked through the severely damaged rooftop, threatening to harm priceless artworks inside. Then, in 2013, the Palestinian Authority, the internationally backed self-rule government, took the lead in financing the restoration. The rest has come from the Palestinian private sector, the Roman Catholic, Greek Orthodox and Armenian churches and other countries. Al-Bandak said nearly $8 million has already been spent. The renovation is being conducted by a joint team of engineers, restoration experts and workers — Palestinians as well as Italians from "Piacenti,'' a firm which specializes in the renovation of historical sites and has worked on dozens of villas, palaces, churches and monasteries in Italy and Russia. Over the past two years, specialists have replaced the most damaged of the ancient wood beams of the rooftop and put up a new cover. They also installed new wooden framed windows that prevent water infiltration. 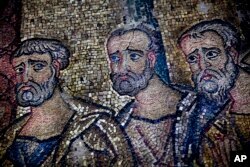 For the first time in almost 1,000 years the thousands of fine mosaics' tiles have been retouched. Mimmo Nucatolo, who heads the Italian team restoring the mosaics, called the gold, green and pastel artworks ``a unique example'' made by skilled mosaicists at the end of the Crusader period. But he said that after centuries of neglect, the mosaics were in such a bad state that they almost disappeared from sight. "From underneath you could no longer see the colors, so much so that some people were wondering 'Do we really have mosaics in this church?''' Nucatolo said. While experts are still carrying out work 10 meters (32 feet) above ground, visitors and pilgrims will have to wait until the end of 2016 before being able to admire the winged creatures and brightly colored mosaics that have been brought back to rare brilliance. After completing the mosaics in the central nave specialists are now renovating those in other areas of the church, working on wall plastering, restoring the external stone facade and repairing the wooden beams. The metal scaffolding will only be removed after these steps are completed, said Afif Tweme, the restoration's project manager. He said he hopes this will be done by the end of the year. The plan is also to install a microclimate system to control sunlight, temperature and humidity in the church, as well as new lights and a smoke detection system, Tweme said. The Roman Catholic, Greek Orthodox and Armenian churches share ownership of the church, and run it according to a 19th-century agreement that assigns responsibilities for upkeep that are jealously guarded by each denomination. The churches have traditionally viewed each other with suspicion and have had fraught relations. But al-Bandak said they have all been "very cooperative" throughout the restoration, even allowing access to the church in the dead of night to facilitate the work of experts. The full restoration will continue in phases and is expected to take at least another three years. Additional projects will include work on stone capitals and columns as well as on the ancient floor mosaics currently covered by stone flooring. The work will depend on the availability of funds. Al-Bandak said an additional $11 million is needed. The Palestinian Authority has already launched a campaign to raise the funds and Abbas has pledged to follow through. "He told me from the beginning: 'Even if you don't have all the money to go ahead, start. This is a holy place and money will come,'" al-Bandak said. The completion of the first phase is already a source of pride. "We are very proud of it because when we protect our national heritage, our history, we protect our future,'' al-Bandak said.